Releasing their self titled EP in 2013 after their signing to Curb Records (home of artists like Mikeschair, Natalie Grant and Plumb, to name a few), OBB, a band of brothers (Zach, Jacob and Nich Oswald), are ready to bring to the world their full length album debut in Bright Side, dropping on iTunes, Amazon and physically in stores at the end of September 2014. While they are still relatively new to the label and new to Christian music in general, this pop band with mainstream similarities to the Jonas Brothers or One Direction have made their statements clear- to bring us positive music as we are reminded of the Saviour’s love for us. Never really much straying from the radio friendly pop/CCM mould, what this band does offer is passion, heart, and enthusiasm way beyond their years (all of the members in the band are in their late teens and early 20s). From Atlanta, Georgia; OBB have given us possibly one of my favourite pop albums of the year since Moriah Peters’s Brave and Francesca Battistelli’s If We’re Honest. Similar artistically and vocally to artists like Anthem Lights and Tenth Avenue North; these three siblings have carved up a collection of songs that are uplifting and encouraging, with themes of redemption, renewal and hope brought to the fore as we are reminded that ‘…You burn brighter than a million stars and nothing can compare, let me shadow who you are, every second and everywhere…’ (“All Eyes on You”). Both “All Eyes on You” and “That Kind of Faith” were singles released prior to Bright Side, and while both still had that CCM-pop shine that wasn’t necessarily there on their self-titled debut project, the band still used these songs to glorify God and remind us of where our focus should lie and whom our focus, worship and attention should be placed upon. A catchy song that frankly has way too much autotune than the song really needs, “All Eyes on You” is as pop as it gets, and with lyrics like ‘…all eyes on You, in everything I do, everywhere I move, let your love shine through…’, you can almost be forgiven in thinking that the band were talking to good friends rather than to God. Yet despite my own grievances, the song still is enjoyable to hear, and while I probably would’ve wanted the song’s intensity to be brought down a notch and for the melody to be less focused on electronics and more focused on lyrical impact, “All Eyes on You” serves its purpose as a dance/pop melody that facilitates an emotive response towards God. “That Kind of Faith” is a much more reflective and anthemic melody, and in some ways, a song that stirs the soul more as the band remind us of the kind of faith they want for themselves (and hopefully what we want for ourselves too). As the Oswald brothers declare amongst the light percussion that ‘…I wanna see the impossible, wanna do the unthinkable, wanna live all the dreams that you have for me today…’, we hear a sense of urgency and longing, something we ought to have as we yearn to be like Christ in every way- even having the faith He had when He trusted God the Father on the eve of His crucifixion. OBB also offer acoustically driven “Wake Me Up”, looping percussion gang-vocal dance melody “Who Cares If We’re Dancing” and first track “Gone”, and while these melodies sound a little One Direction-y, the messages are paramount- waking us up from our slumber to see the physical and spiritual needs around us, dancing as an expression of our love for God (and not caring about other people’s opinions of how we show this love), and assuring listeners that sin has no hold on us; respectively. “Up Close and Personal” is a song that stood out for me personally from first listen, and while the song may fly under the radar in favour of more upbeat songs like those aforementioned, OBB have created a winner in my opinion, as we see the vulnerability as the band long to be closer to God, in the poignant lyrics of how sometimes we could ‘…wish that you were speaking through a megaphone, telling me exactly what I need to know, I know you’re whispering but I’m bad at listening…’, but realise that we need to be still and de-clutter our lives if we want to be ‘up close and personal’ in our relationship with Christ. With a heavy piano presence, lead singer Zach delivers one of the most emotive songs on Bright Side. Three and a half minute “Above It All” presents a radio friendly track that encourages us to see God above all our circumstances we face- while possibly the most musically safe song on the album, “Above It All” presents a theme needed to be heard more often than not; that Christ is above all our circumstances, and that He’s working everything for our good, even if we’re in the moments where we can’t see or even believe it! Ending the album with songs “Beyond This Moment”, a song fit for radio as OBB present a theme of us looking beyond what we experience and see in front of us to try and see from the eyes of Christ and have a glimpse into what God is longing to accomplish out of what we experience in the here and now, and “My Relief”, a piano pop melody that acknowledges that the weights on us are too heavy as we cry to the Lord to be our relief when we need Him the most; OBB’s heartfelt songs and a wide array of music genres and styles continue to affirm that the trio are one of the most underrated and up-and-coming bands over the last few years, and a band certainly to look out for within the next year or so. 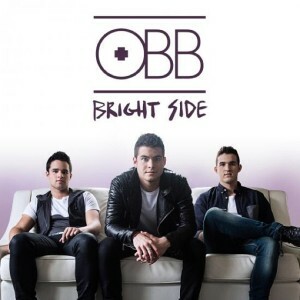 With Bright Side being one of the ‘bright’ albums of September 2014, alongside albums from for KING AND COUNTRY, Tim Neufeld, Lecrae and Lara Landon; OBB have managed to break past the sophomore slump and give us a formidable second album on Curb Records. While I probably would’ve expected this album to be much less radio pop than what it actually was, what Bright Side delivers is good radio pop- and if the album is taken and listened as it is rather than what we all wish it to be, the album will serve as a great vessel for praise and worship, which is exactly what OBB accomplish within these 12 tracks. Fans of Tenth Avenue North, Manic Drive and Anthem Lights will love OBB and their music, with Bright Side offering us the best of CCM pop this year since albums from Francesca Battistelli and Moriah Peters. Well done Zach, Nich and Jacob for an inspirational and encouraging album!